Born in 1952, Maureen Davies studied art at the St. Alban’s School of Art, followed by a degree in Textile Design at the Central School of Art and Design in London. 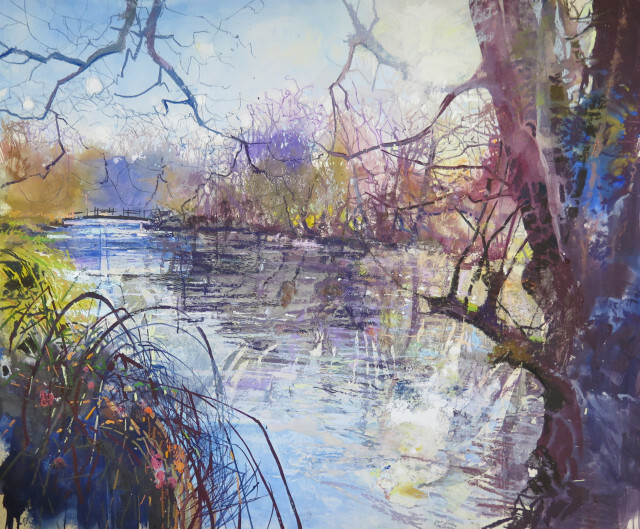 Over the last decade, she has exhibited widely in the south of England and at the Mall Galleries in London. In 2007, she took the winning entry in the International Competition for the Society for All Artists and won the Frank Herring Award for The Pastel Society. She was elected a Member of the SWA in 2011. Her current work is concerned primarily with sunlight and with the way it transforms the landscape into colours and patterns. She has drawn inspiration from many diverse locations, different times of day and the changing seasons – winter sun flickering through trees, evening sun at harvest time and the brilliance of light in Portugal. Maureen Davies works in a variety of media including collage, watercolour and gouache, but has a bias towards pastels. Some works are literal in their interpretation, some are more abstract, but all share a strong focus on vibrant colour. Maureen Davies lives and works at Rockbourne in Hampshire.